MidwayUSA is a ‘brick and mortar’ catalog and internet retailer of sporting goods, carrying merchandise related to shooting and hunting and other outdoor products. Established in 1977, this family-owned and operated company employs over 400 and is headquartered in Columbia, Missouri. The vision of the company states that “To be the best run business in America, for the benefit of our Customers, by systematically applying the modern leadership and management principles from the Baldrige Criteria for Performance Excellence.” provides a great insight into the organization’s DNA. MidwayUSA constantly strives to achieve its goals of Customer Satisfaction, Employee Satisfaction, Vendor Satisfaction and Shareholder Satisfaction, and the accompanying Key Stakeholder Requirements. These goals, along with the results from our Key Measures, are key components of Midway USA’s Strategic Planning process, which is considered to be a best-practice approach to planning. 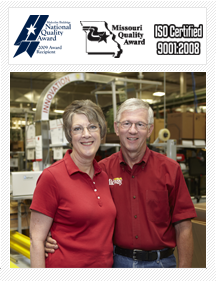 MidwayUSA is ISO certified 9001:2011, a 2008 recipient of the Missouri Quality Award and a 2009 recipient of the Baldrige National Quality Award. Focus on the Customer at MidwayUSA is a strong factor in overall organizational success, substantially driving the Company’s 93% Customer Satisfaction rating. The ‘Larry Line,’ allowing Customers to communicate directly with the founder and CEO, is unprecedented in the industry. Innovation is clearly evident throughout the MidwayUSA organization, displayed physically in the Nitro Express material handling system and electronically in the organization’s website, purchasing and order processing systems and processing of products all through the material handling system. Product offering grew by 168%.